Alfred Hitchcock did not know his birds very well, otherwise he would not have used mere crows and gulls in his avian horror movie. 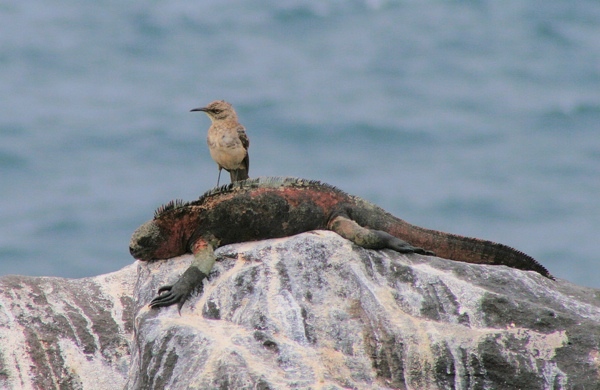 The truly terrible birds that stalk the world’s continents and remote islands are among the creepiest and most disturbing creatures. We follow these feathered stalkers which inspired the unclean birds of ancient religious texts, folklore warnings, and the demons of many nature religions. Vampirism, impalement, ghoulishness are the hallmarks of these species. One may even harvest humans on occasion. 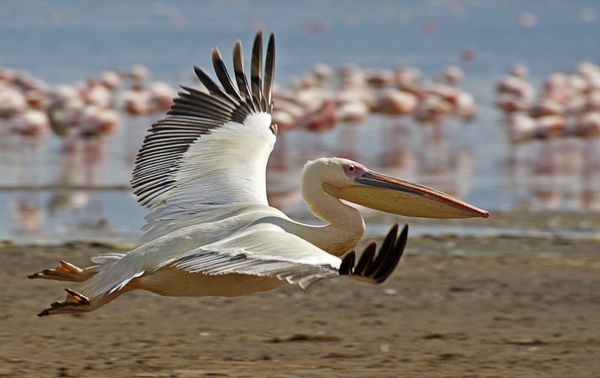 Great White Pelicans roam the coasts of Eurasia, filling their multi-gallon bills with fish and other sea life. 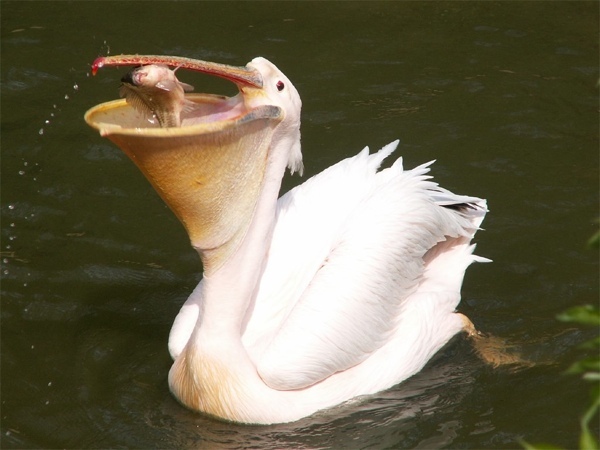 However, there are few limits to the pelican’s ability to swallow prey whole, and rather surprising larger animals may be targeted. Recently, a Great White was filmed at a London park capturing a live pigeon in its massive jaws, before swallowing the bird . . . alive. 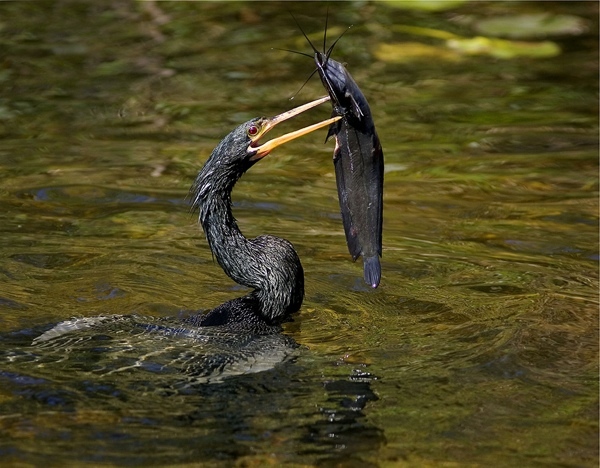 Not many avians are capable of simply swallowing another bird whole. Even adult gulls and young cormorants—pelican relatives—have been drowned and swallowed headfirst. How much carnage occurs on the world’s lakes, out of sight of human observers? 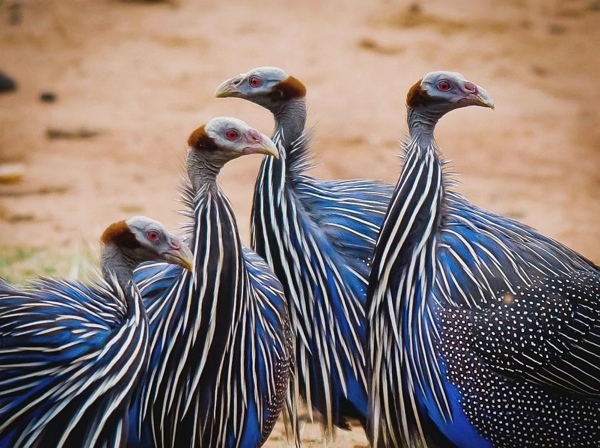 Vulturine Guinea Fowl are extraordinarily creepy game birds. 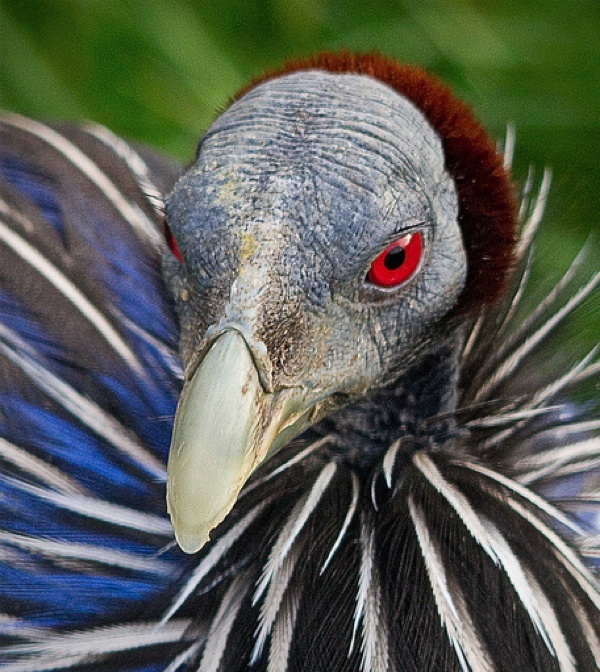 These highly aggressive, sharp beaked ground stalkers hunt in groups, and unusually for a relative of chickens, capture and kill small mammals. It is their appearance that is the most horrifying, however. Vulturines have dark plumage from which emerges a snakelike neck. 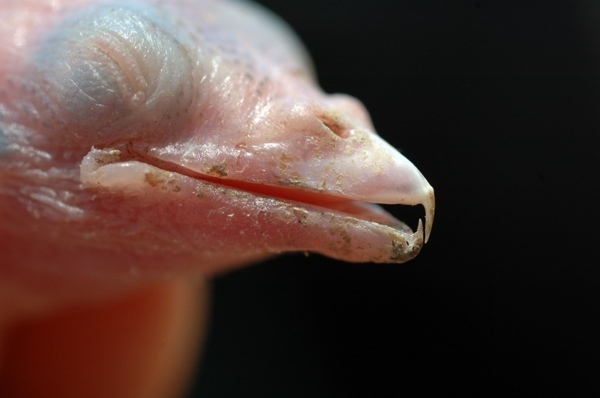 On top is a nearly featherless head from which several accent feathers stick out. The bright red, staring eyes add to the awful appearance. 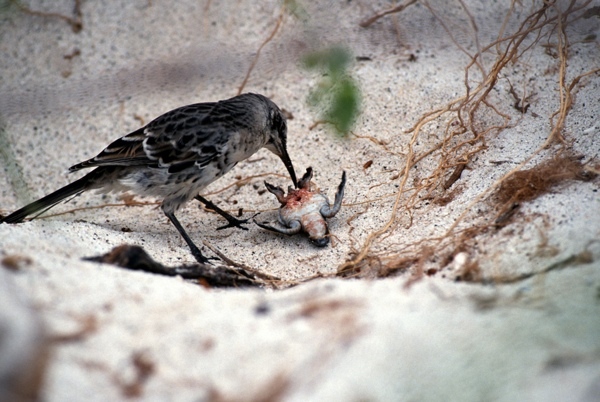 To resolve territorial disputes, the males of this primitive bird species lash out with sharp spurs and slash opponents with their sharp bills. 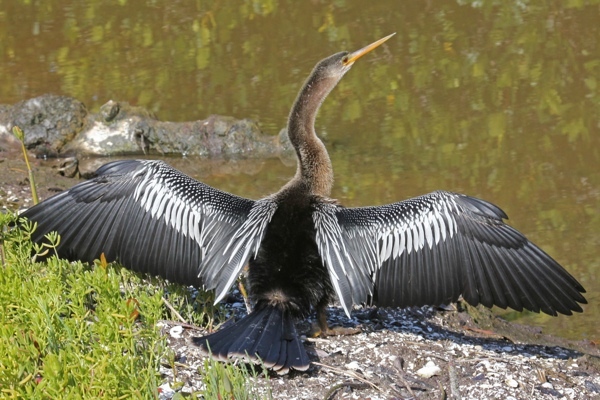 Anhinga are more commonly known as Snake Birds. When they rise up from the depths of a swamp, just their neck and razor sharp bill is visible. To add to the creepy factor, these strange waterbirds are all black, make weird growling calls, and can sink silently into view before disappearing underwater. The creatures have inspired much superstition and folklore with their disconcerting appearance and mysterious habits. To assist in diving, the bird’s plumage is not fully waterproof. The birds can occasionally be seen emerging from the swamp to dry off. Bram Stoker meets The Birds . Just when it couldn’t get worse among avian monstrosities, we discover the Vampire Finch. This close relative of pet canaries and Alfred Hitchcock’s chimney swarming house sparrows has evolved with a disturbing difference. 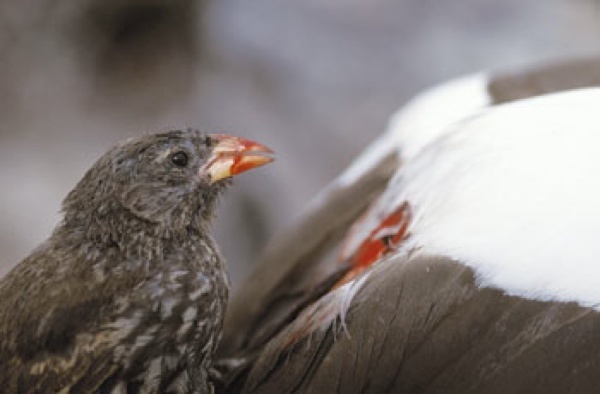 Using its sharp beak adapted for capturing insects, the Vampire Finch has developed the gruesome habit of approaching adult and juvenile birds of all sizes and grasping on with its feet, then gashing them and drinking their blood. Such a small vampire bird is hard to shake off, and will quickly return for more due to its high metabolism. Nothing is creepier than a little songbird that latches on and drinks blood. The Greater Honeyguide has developed a strong relationship with humans by guiding them to honey so the humans can break open the hive. The humans are supposed to then share with the bird. However, the only bird that does business with man has an unethical side that borders on nightmarish. Greater Honeyguides emerge featherless from eggs laid in songbird nests—in the same manner as a cuckoo. 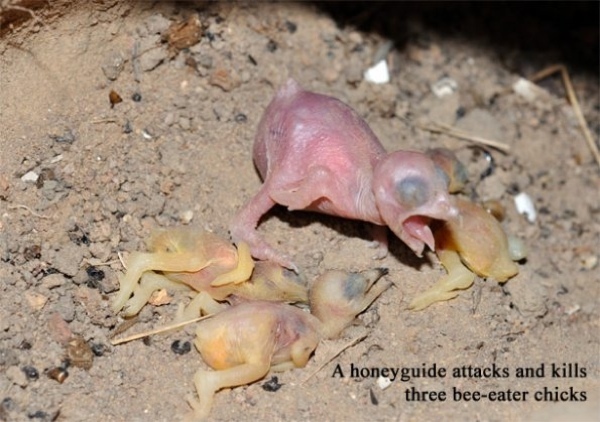 Using a ghoulish bill hook, the young slash, rip and shake their nest-mates, leaving only the single Honeyguide chick. As the juvenile prepares to grow larger than its foster parents, the monstrous bill hook drops off. South-Central and East Africa is home to a huge raptor that may be a man-eater. 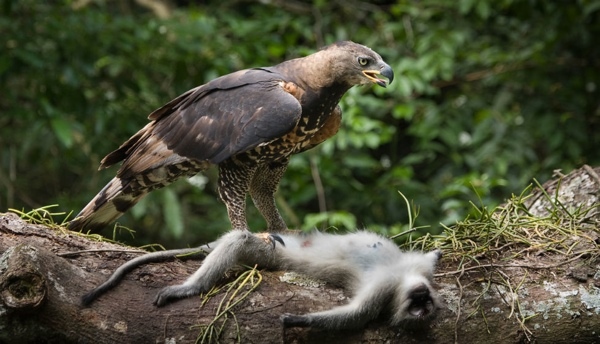 The African Crowned Eagle is one of the largest birds of prey on the planet, and it relies on sizable monkeys as a primary component of its diet. On one occasion, a Crowned Eagle attacked a seven year old child on the way to school, and bystander intervention was required to free the child from the eagle’s grasp. Antelopes are another favored food source for this magnificent, yet menacing super-raptor, which has sadly declined from habitat loss. 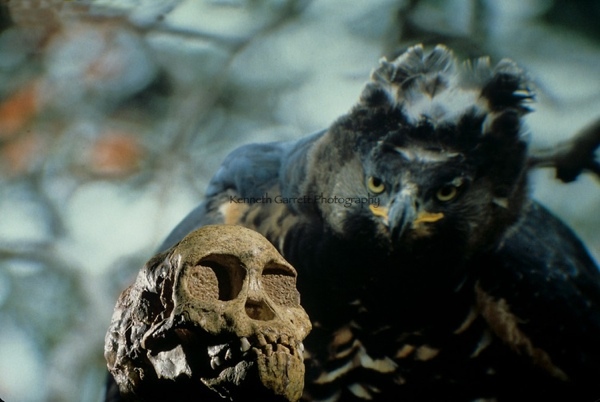 In another case, a small human skull was discovered in a Crowned Eagle nest. The Great Gray Shrike is a magnificent relative of crows and the innocent looking vireos. 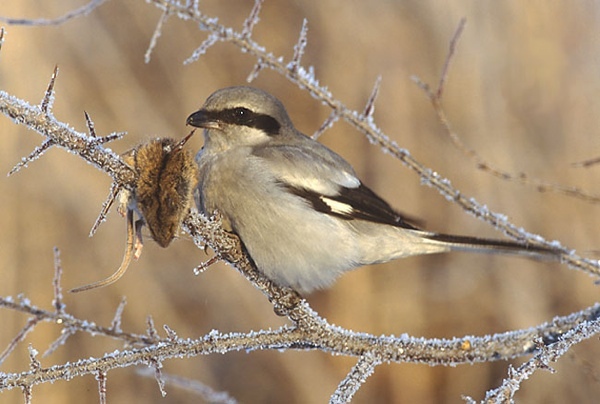 But this songbird is a wannabe raptor, and due to its inferiority complex, Shrikes come with their hang-ups. Literally. Great Grays lure in songbirds by mimicking their calls, hammering them to death once they are within reach. 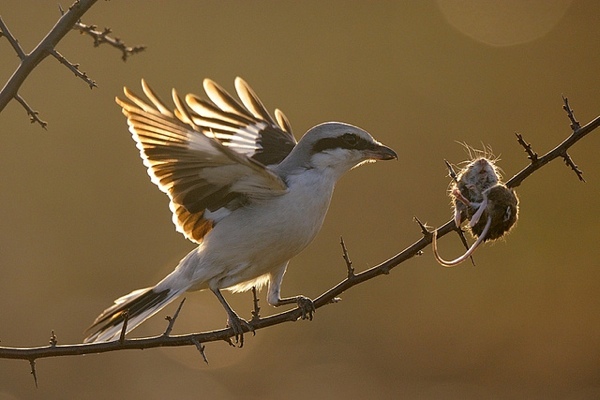 Lacking talons, the Shrike drags its prey to the nearest barbed wire or thorn bush, impaling it forcefully on the object. The prey is then torn apart and consumed. During the breeding season, males impale multiple songbirds along the perimeter of their territory to ward off rivals and impress hens. Popular penguin films fail to disclose a terrible and dark shadow looming over the colonies of these almost humanlike Antarctic waterbirds. Macronectes giganteus. 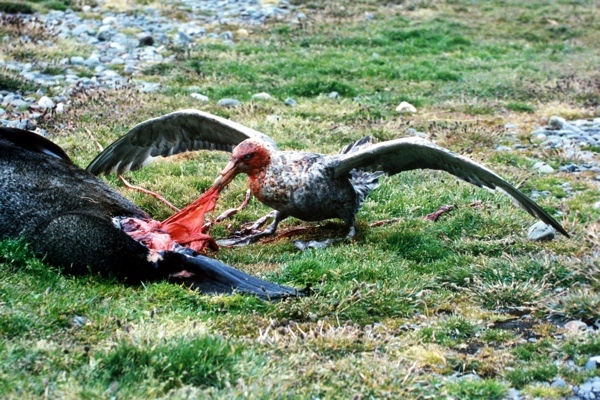 The Southern Giant Petrel. Weighing up to 18 pounds (8 kg) with a wingspan of 7 feet (2 meters,) the ghastly Giant Petrel stalks the colonies of multiple penguin species. Entire adult penguins and the large young of huge Emperor Penguins are seized by this monstrous, yellow eyed marine bird with the appearance of a gigantic gull or demonized albatross. Having no raptorial adaptations, this terrifying avian freak of nature conducts incredibly crude and brutal butcherings in its bid to live like an eagle. You can see a shocking attack here. 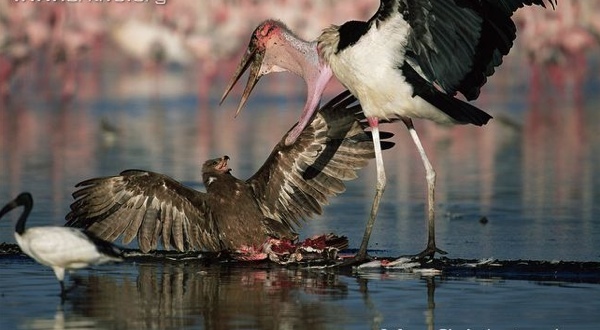 Marabou Storks are the truly the most ghastly of all living birds. The huge creatures may be the largest land birds on the planet, standing up to 5 feet (1.5 meters), with a wingspan reported to extend over 10 feet (3 meters). 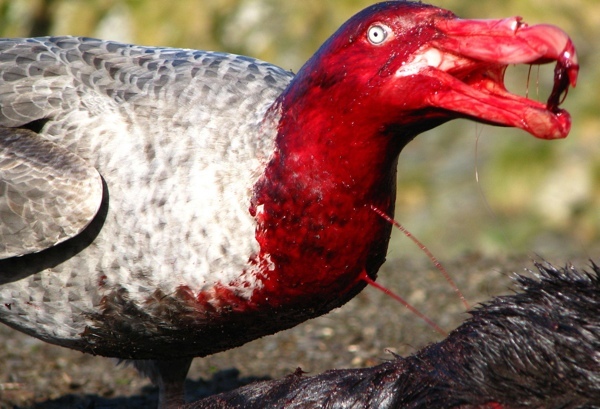 The fleshy, featherless head is often stained with blood, while the massive, bone colored bill extends 14 inches (35.5 cm). Marabou are known as undertaker birds due to their appearance and feeding habits, making ghastly croaking sounds as they chase predators away from their kills. These monster storks have lashed out and killed children who approached them, quite a contrast from the image of a stork delivering a baby. 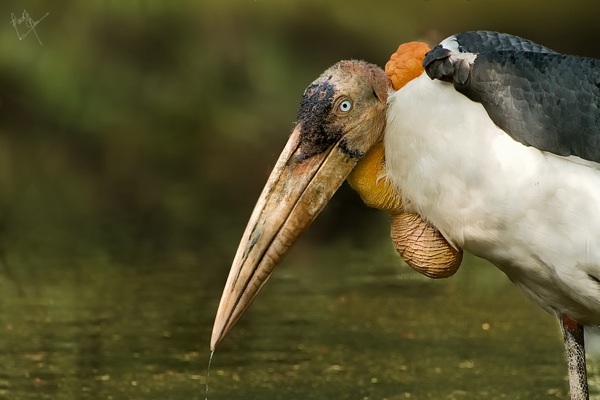 I have added this as a bonus because of its similarity to the Marabou Stork. 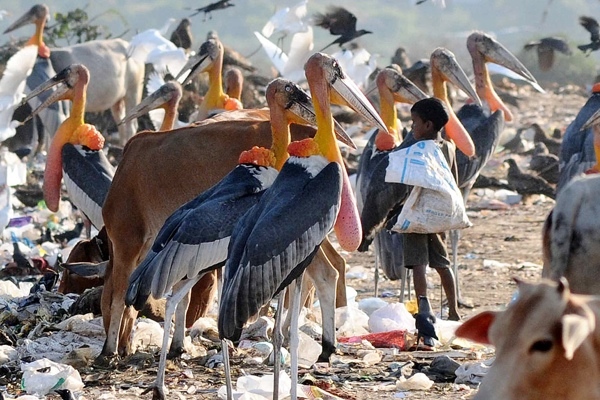 The Greater Adjutant is living proof that travel does not solve everything. 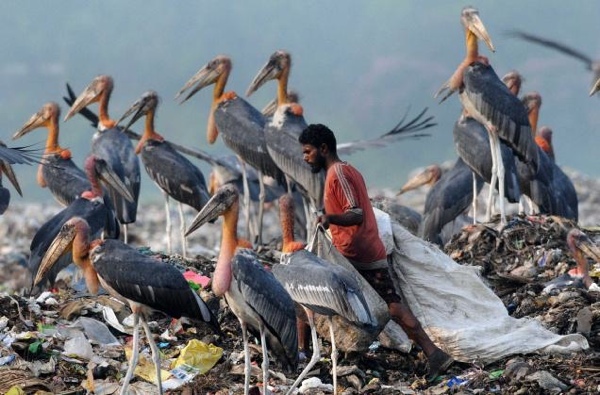 For India, just like Africa has its own monster stork. 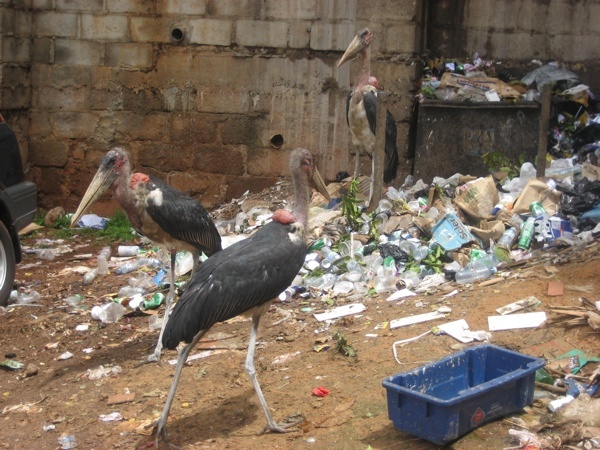 The Greater Adjutant is feared as an unclean bird, but is also revered as an expert scavenger. 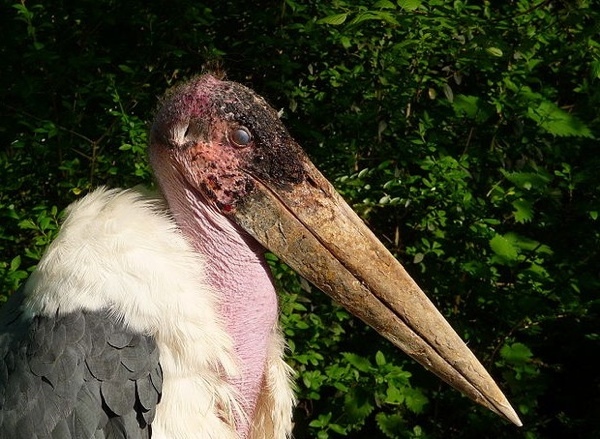 This enormous, ghastly bird may be seen perched atop garbage dumps, but it also follows funeral events and has attempted to feed on human bodies during the disposal process. Human and dog excrement are also favored by this grotesque avian. 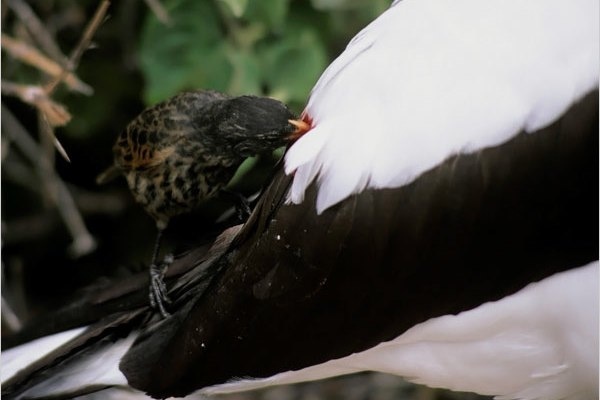 When waste is not available, it becomes a shocking predator, grasping live ducks and other waterbirds in its massive hollow bill and—like the Great White Pelican—swallowing them whole.